The importance of wildflowers in the countryside Few of us can have failed to notice radical changes in our countryside over recent years. These are things we read about in our newspapers and hear about on the news, almost on a weekly basis. These changes include many diverse factors especially loss of habitat, removal of hedgerows, building of roads and houses and the implementation of farming practices very different from those employed a hundred or even fifty years ago. However these changes are viewed, either as progress or as backward steps, the results have been that much of our countryside has been radically altered. These changes have seriously depleted the wealth of native wildflowers we once saw around us and our native wildlife has been acutely affected as a result. The decline of many bird species, the loss of bumblebees and lack of butterflies and other insects, have all been linked to these changes. How does this relate to our gardens? Encouraging wildlife into gardens has always been a priority for a minority of people. Over the last thirty years, this way of managing gardens has become much more main stream and now many people would say that to a greater or lesser extent, they consider and make provision for the wildlife in their gardens. Many conservation organisations now advocate wildlife gardening as a means of helping to compensate for habitat loss. Figures show that some species, including amphibians such as frogs and toads, rely to a large extent on garden habitats (in this case garden ponds) for their continued survival, as their wild habitats continue to disappear. Wildlife gardening really can make a difference. It is unlikely that rare species are protected from extinction by the enlightened gardeners who welcome wildlife, but it is certain that many species of invertebrates, birds, mammals, amphibians and reptiles can comfortably find shelter and food in our gardens when their requirements are catered for. This means growing the plants that they depend on, and managing our gardens in a way that is sympathetic to the sometimes complicated life cycles of our native creatures. A little knowledge about our native wildlife can go a long way towards helping it. One very positive and important thing that we can do to ensure that wildlife visits our gardens, or even takes up residence, is to grow some native wild plants. This includes not just the wildflowers we are talking about here, but also wild trees and shrubs, which are covered elsewhere on this website. But how can growing wild plants attract a hedgehog or a frog to a garden? In order to understand this concept we have to take a closer look at the ecology of gardens and the ‘food chain’ that exists there. Garden food chain Every garden, no matter how devoid of vegetation, will contain a large number of invertebrates. This is a group of animals that includes the insects (bees, butterflies, beetles etc. ), molluscs (slugs and snails), spiders, earthworms, and several other groups of creature that we may easily overlook. They will exist in the soil, in or under dead wood, in the compost heap, tucked under almost every leaf of every plant, or they could simply be flying about in the air. These small animals form the backbone upon which virtually all our other garden wildlife depends, either directly or indirectly. They are the focus around which everything else revolves. Invertebrates provide food for just about anything that might visit our gardens, from foxes and badgers (which eat a lot of earthworms), to green woodpeckers (feeding on ants). It is really quite simple: no ants in your garden means that you are unlikely to regularly see a green woodpecker – a gorgeous bird that anyone would be delighted to have visiting their garden. The importance of these small invertebrate creatures, which are so vital to the garden food chain, cannot be emphasised enough. If we are interested in helping wildlife, our task as gardeners is to encourage as many of these invertebrates as we can to inhabit our plots. If we are successful in that, everything else, over time, follows naturally. So, how do we get these ‘mini-beasts’ to take up residence? There are many techniques that we can employ, and a general wildlife gardening book will outline these. But the one really important thing we can do is include native plants. Our mini-beasts, over time, have evolved to depend upon our native wild plants for food or shelter. They are used to them, they are adapted to the chemicals they contain, they are attracted to their scent. Many of these plant-insect associations are extremely complicated but others are very simple. For example, the small tortoiseshell butterfly will only lay her eggs on a nettle leaf. She knows it by its scent and seeks it out specifically for this purpose – it is the only plant her caterpillars will eat. This interaction of plants and invertebrates is the natural way of things, and something we can use to our advantage when deciding what to plant in our gardens if we want to attract wildlife. What is a wildflower? A wildflower is a British native plant – a species that has evolved over time alongside our animal wildlife. This could exclude some species, for example corncockle, which most people would assume is a native but is an introduced wildflower. It was probably brought to our shores by the Romans, along with crop seeds, long enough ago for it to become an important part of our farmland flora, and then to disappear again! This does not mean that it is not a beautiful addition to a garden or that it is not valuable if you wish to attract wildlife. It simply means that it is not technically a British native but you will still find it recommended on some of the pages here. What are ‘naturalised’ wildflowers? These are species that have usually escaped from garden situations to establish themselves in the countryside. Many of these we have happily accepted and plants as familiar as broad-leaved everlasting pea, evening primrose and (possibly) snowdrop are all examples. Many naturalised plants are harmless and even a useful addition to our native flora, but others cause huge problems, for instance Himalayan balsam and Japanese knotweed. They may even threaten our own native flora and fauna, so are best avoided in our gardens. 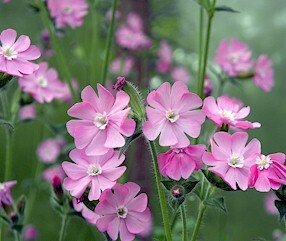 Another anomaly to mention here is the wildflower in an unfamiliar colour. Colour variation in wildflowers, for example the white foxglove or pink violet, is a relatively common and naturally occurring phenomenon. These are really useful additions to any wildlife garden. Where can we grow them? There are places in any garden, however small, where these plants so important to our native wildlife, can be grown. There is a native wildflower for every situation, no matter how dry, wet, shady or hot. Other pages on this website will help you to choose the best for your garden. Growing wildflowers is one of the best ways, but not the only way, of attracting wildlife to your garden. So include plenty of wildflowers and wild grasses if you can and you will not only be providing pollen and nectar for local bees and butterflies, but encouraging wildlife to breed and make a home in your garden.